It'll be here before you know it: holiday season. If those two words just sent a chill up your spine, it's probably time you started getting prepared. The good news is that while may think your house needs a bulldozer, or at least a few teams of HGTV stagers to make it guest-ready, it will probably be easier than expected to get it in good shape. Here are a few things you can do this weekend to get started. If your guest room looks old and thrown together, a few easy fixes can have it feeling like a welcoming space. "Unless you're constantly hosting visitors, your guest bedroom probably goes unused much of the year," said HGTV. Isn't that the truth. In many guest rooms, whatever furniture exists is often leftovers from other spaces. But that doesn't mean it can't look great. If you're not looking to add to or replace anything in the room, get out that paint can. A coat of paint can transform a dowdy old dresser into something fantastic. How does the bed look? Tired or drab bedding can make the whole space feel blah. Thankfully, you don't have to spend a lot for a great set of sheets. 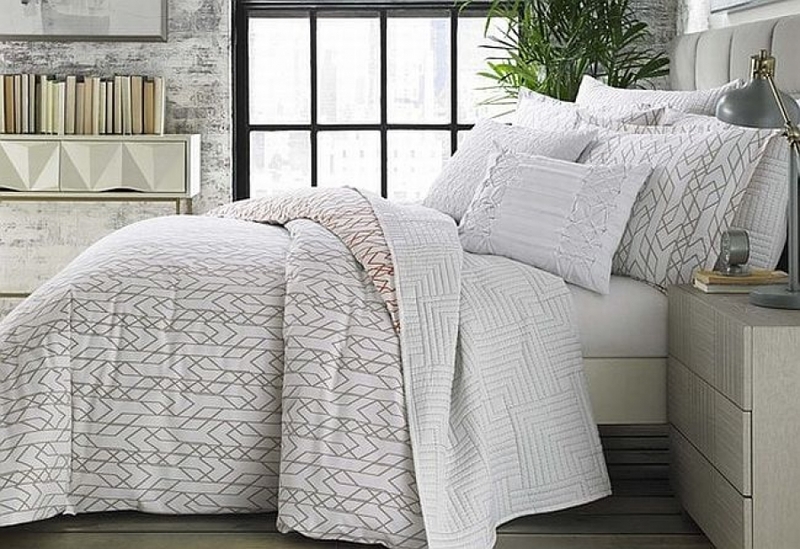 Top it with a graphic-patterned comforter and a few pillows, and voila. On the nightstand, a favorite book and a scented candle will make your guests feel well-taken-care-of. If you get out the good stuff for the holidays, you don't want it to look tarnished. Several simple tricks will have it looking stellar in no time. Our favorite: ketchup! Stores like HomeGoods, Tuesday Morning, or TJ Maxx can be a goldmine for little, inexpensive items that can make your guests feel like they're staying at a fancy hotel. Stock up on guest soaps, hand towels, lotions, and, if you really want to be fancy, set out a new robe and slippers. While you're making everything look pretty, make sure you consider function, too. Your guests will need a place to put their things. This is a perfect time to put away summer clothes or pack up a few boxes of giveaway stuff to create space in a closet. Now, hit your coat closet. "Plan ahead! You know guests will be coming in from the cold and will need a place to hang their coats," said Huffington Post. "Go through your closet or the hooks by your door, and store away any extra jackets you may have hanging there." While you're out shopping, hit the lighting aisle, too. "Even though you can navigate your home blindfolded, your guests can't," said houselogic. "Make sure outside lights are working so they don't trip on the way to your door. Put motion-activated night lights in hallways, bathrooms, and bedrooms to ensure safe passage after the sun sets." Everyday scents, especially if you have pets, can get past us in our own home. Believe it or not, there is actually a science behind this. "We adapt to smells very quickly," said Mental Floss. "Within the space of just a few breaths, we can lose our ability to detect new odors. It's called olfactory adaptation, and it's the same reason you can't smell your own breath, your body odor, or even your perfume after a few minutes." Outside of the typical tactics of cleaning and deodorizing, there are a few tricks that can help freshen up your place: "Fill 2 to 4 shallow bowls with fresh coffee grounds, depending on the size of the room," said SF GATE. "Shut the windows and the door to the room, then leave the bowls overnight to let the coffee grounds absorb the odor. Throw the coffee grounds away the next day. Repeat one more night with fresh coffee grounds for particularly stubborn odors." Another quick fix for a lingering stink: "Pour about a cup of white vinegar in a sauce pan on your stove top and bring it to a simmer," said lifehacker. "The simmering vinegar will release more odor-fighting power into the air, and if you let it go for a while, it will deodorize your whole house. It might smell a little vinegary at first, but after a little while it won't smell like anything at all."